A 2nd Eye Camp was organised in Rajasthan in association with the Blind People’s Association (BPA) & Shared Vision Sansthan (Jodhpur). A 2nd Eye Camp was organised in Rajasthan in association with the Blind People’s Association (BPA) & Shared Vision Sansthan (Jodhpur). 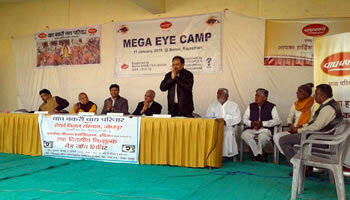 The eye camp was a CSR initiative to help the villagers gain access to better eye health, free medicines and treatment for patients with cataract. Shri Paras Desai, Executive Director, Wagh Bakri Tea Group also addressed the patients and encouraged them to take maximum benefit of the eye camp.